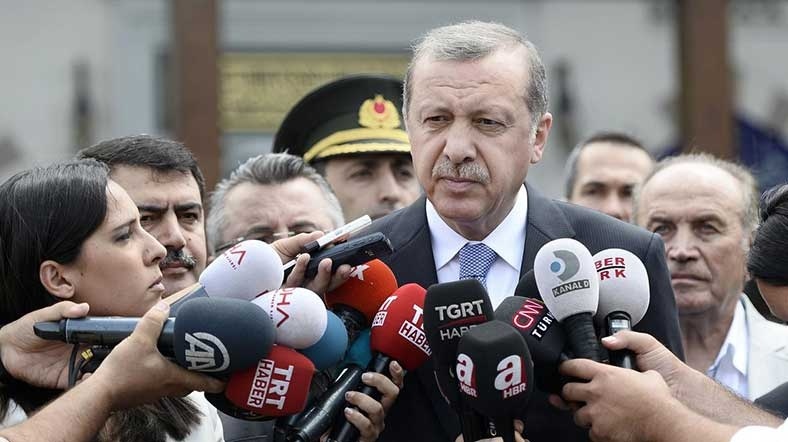 President Recep Tayyip Erdoğan said there is no journalist who was imprisoned in Turkey that those in prisons are only terrorists and thieves. Speaking to a business forum in US on Wednesday, Erdoğan said Turkey arrested scores of journalists not because of their journalistic activities but because of criminal records. “The ones who have been sentenced, who have been imprisoned, are not journalists. Most of them are terrorists. Many have been involved in bombing incidents and burglaries, and some have been caught red handed as they were trying to empty ATM machine. …” Erdoğan said. “Those [journalist] who act like spies will be subject to trial,” he added. Turkey has arrested at least 302 journalists since the last year’s abortive coup, thanks to which the government has broadened terror charges under emergency rule. Turkey currently keeps 188 of those journalists in jail as the remaining have been released pending trial. Turkey Purge monitors unlawful crackdown of Turkish government in the aftermath of the failed coup, maps human rights abuses, hate crime and hate speech against political dissent in the country.